In the previous article we have briefly discussed iTunes Store. First of all, we presented a wide range of items we can find there, and instructed you how to create the iTunes store account. Then we guided you how to download free content (podcasts). Once we taught you the ropes, it is time to move on - to buy the paid items. Apart from free items (we instructed you how to download them in the previous article) iTunes offers a huge selection of paid materials. The iTunes store enables you to buy the latest albums and films or rent them in HD or SD quality as well. However, if you want to pay for that, you need to have an account and an assigned credit card. If you did not assign a credit card to your account while registering, you must do it immediately, otherwise you will not be allowed to purchase anything. In order to add a card you need to log into the iTunes Store and then click our login button. The next step involves selecting “Account” from the drop-down menu. Next, your personal details and information concerning your account will be displayed. To add a card, you need to choose Edit in the Payment Information. iTunes will display a screen where you can change payment method or add a new one. Then we need to choose the type of credit card we possess, insert a credit card number, credit card expiration, as well as Security Code i.e. the last three numbers placed on the back of your credit card. Once you have finished entering all the required data, save them by clicking a button at the bottom of the screen. We can either buy an individual song or a full album in iTunes Store. The process of purchasing is as easy as pie. All one needs to do is use the main toolbar to go into Music section and look for an album that you want to have. By using a sidebar, we can browse for music genres that are available as well as limit the search results to specific genres. We can also use the search engine and simply type the name of favourite artists. If you want to get more info about a particular album just click on it. You can read on the comments as well as check the list of all songs. By clicking Play button next to the song, we can listen to samples. Each song carries its own price, you can see it next to the name of the song. Once you have done that, a small window will appear in which iTunes will ask you to confirm the purchase. This time we don’t need to log in or enter the password, we just have to click ‘Buy’ button and wait for paying money from our account and finally downloading the file. Want to buy the whole album? No problem, you can buy the entire albums as well. To do so, you need to click ‘Buy’ button just below the album cover on the left. After clicking ‘Buy’, iTunes performs a buying process in the same way as it does in the case of a single song. As far as film items are concerned, buying films is similar to buying music. The film banners include information if a particular film is available with subtitles or dubbing. 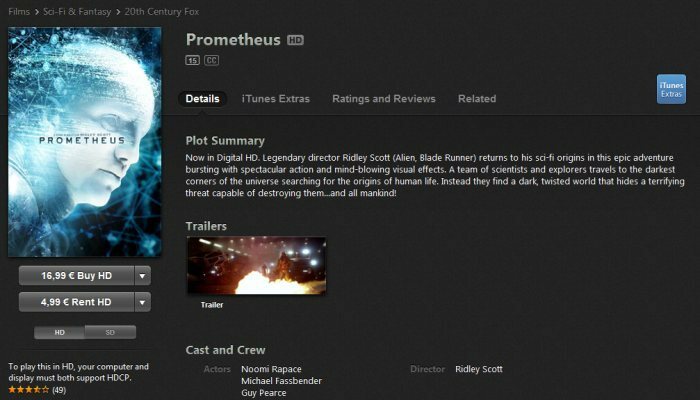 When we search for an item which seems interesting to us, we can click on its cover and iTunes will display film cast and trailer. You can watch the trailer for free-just click on it. Most of the films are available in two versions: HD (high image quality) and SD (standard definition). HD films are more expensive than SD ones. We can switch between them by using HD and SD buttons which are placed on the left side of the window below cover and price. After choosing the quality, you can either buy it or rent it. In case of buying a film, it is added to our film library forever. Renting the film is slightly different. After renting a particular film, you don’t have to watch it even up to 30 days. However, the catch is that if you start watching the film, even for a while, you have got only 48 hours to watch the whole film. During this time, you can watch the film as many times as you wish, however after 48 hours it will be not available in your library. When we decide to buy or rent a certain film, we need to click on the appropriate button. iTunes will display a familiar window in which we have to enter the password and log into iTunes Store. Just enter the password and click on ‘Rent’ or ‘Buy’ button. The whole process is similar as in the case of music - iTunes will ask you for confirmation. After a while, a short message will appear, informing about successful authorization. We can assign up to 5 computers to our iTunes Store Account. Now we can click ‘Rent’ again and rent the film without any issues. How to safely bank online?